Machinery Indent has many years of industry experience, enabling us to offer genuine advice and guidance. Our team has the expertise to help you choose the ideal machines to suit your specific needs. We have a wide range of top-quality welding machines, each designed and manufactured to exacting standards to ensure safety, accuracy and quality at all time. Take a look at our carefully selected products below. Pick up the phone and call us on 03 9357 9896 to discover more about what we can do for you. Alternatively, use our online enquiry form and we will get back to you as soon as we can. Our team will be happy to provide all the information you need and answer any questions you may have. The GAM HS plant is based on the concept of the “mobile heads” supporting and driving the rotation of the longitudinal bars, while the welding robot moves along the forming cage. The “Master Head” hosts the forming ring where bushes are fixed to make a perfect and precise template where the longitudinal bars can be positioned according to whatsoever cage size and design. The whole production process of cages has been simplified as well as “fine tuned” in specific aspects. The whole manufacturing cycle is now fast as never before, for this type of product. Cage making machines belonging to the GAM HS Series, are designed for production of pile and square cages of various shapes and sizes. 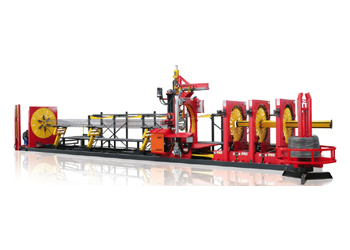 The technology of the GAM HS Series is based on the winding of a continuous offcoil spiral around the longitudinal rebars by mean of a traveling welding robot station. This plant offers productivity and quality of finished products having a very compact lay-out and therefore being suitable to be installed within a limited footprint. PRATICA 240 is the universal assembly machine (patented system) designed to assist in production of finished cage products. Cages of all shapes and sizes can be made, reducing assembly times, and improving the quality product when compared to traditional methods.